Meditation has been benefiting people for 1,000's of years and it's more simple to do than most people know. You don't have to give up living to get major benefits from meditation and in fact, regular meditation can make your life much more livable. Recent science & medical research proves that meditation can help you become healthier, smarter and more successful. In this interactive talk and demonstration with Sadhu you will not only learn how meditation positively affects your body, mind and well-being but you will also be given meditation techniques used by great meditation masters throughout history and by highly successful people in today's busy world that you can use in simple everyday ways to bring about great changes in your health and in your life. Sadhu Singh has been helping people become more clear & healthy with Meditation, Kundalini Yoga and his down-to-earth yet very dynamic Health Coaching for almost 20 years. 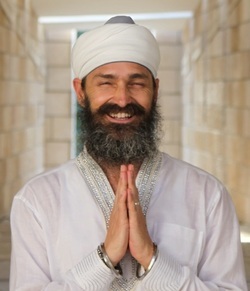 In addition to being one of the most sought after Kundalini Yoga teachers in Miami, with a loyal & growing following for his public classes, he leads international destination retreats and serves a wide range of private clientele from wealth management executives, artists, professional athletes, students to busy parents. Sadhu has trained directly with great masters all over the world including Kundalini Yoga Master- Yogi Bhajan, His Holiness The Dalai Lama, Mindfulness Meditation Founder- John Kabat-Zinn and Deepak Chopra. He has introduced meditation & yoga to special needs inner city children, public elementary school teachers & students and guided corporate meditation presentations and extended corporate wellness programs with The American Heart Association, Canyon Ranch and Merrill Lynch. Sadhu is featured in an upcoming prime time PBS Special and is a returning guest speaker for FOX TV’s Health Watch.